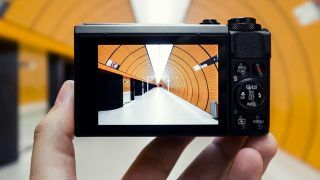 Looking for the best camera for video blogging? Let's examine the best options for your budget. If you're serious about becoming the next big thing on YouTube, you'll want to take a look at our pick of the best vlogging cameras. 'Video blogging' these days is serious business. In fact, if done right, it can earn you good money through sponsorship deals, advertising and partnerships. To get to that place, though, you have to take things seriously; that means building up a large following of loyal subscribers, and you’re not going to do that with a mobile phone on selfie mode. YouTube is a huge platform on which to have your voice heard; so if you’re passionate about a certain topic it’s the place to do it. Whatever you want to share with the world, a favourite recipe, a song you've written or your opinion of the latest game release, a good vlogging camera is an absolute necessity if you’re looking to become the next YouTube sensation. According to seasoned YouTubers, the zoom, pixel number and flash aren’t important as they're stats that favour photos rather than video. Instead, you need to focus on how the camera performs in low light environments, as bad light can reduce the frames per second and create footage noise. There are two ways you can tell that a camera is going to perform well in low level lighting situations. Firstly, the lens size; you should be looking to purchase a camera with a wide aperture lens and a larger sensor as they will capture more light, leading to a clearer, higher quality picture. Next, you’ll want to think about whether your new vlogging camera needs a stabiliser. If you’re looking to hold your camera and move around while filming, you’ll need this vital extra, as it will stop the image from shaking as you walk, and create a much more pleasant viewing experience. Lastly, you’ll need to consider the sound quality. You aren’t going to build up a loyal following if the sound in your videos is muffly and unclear. Make sure any camera you look at is capable of an external microphone input, as this will ensure that your voice is heard loud and clear. To help you find the best vlogging camera for your requirements, we’ve scoured the internet and found a variety of cameras that will help you to make a success out of your YouTube channel. With names such as Panasonic and GoPro making the list, we’ll detail the main aspects of each camera so you gain a good understanding of what each one offers, so you’re not overspending or underspending. So read on to find out more - your audience is waiting. With an ability to shoot 4K quality video and with an advanced sensor for superior lighting, this vlogging camera means business. The Digital Live MOS sensor has the capability to reproduce the finest colour details, perfect if you’re looking to show the world the vibrancy of your culinary creations, while the Three-Dimensional Colour Control ensures colours remain rich whether they’re dark or light. Thanks to its 5-Axis Dual Image Stabiliser, you can be certain that any shaking is corrected for the best quality video. Additional features include a newly adapted motion sensor for tracking fast moving objects – great if you’re looking to do some filming when hitting up the local skate park. Best of all, it hooks up to your Wi-Fi for instant uploads. Vlogging isn’t just about sitting in your bedroom with a camera; many channels become popular based on the awesome footage they film, whether it’s extreme sports, theme park rides or their most recent spin out on the motorbike. When your channel is going to be all about the action rather than those close-in shots of your latest makeup transformation, you don’t need to spend an arm and a leg on the best of the best. In fact, this GoPro camera is probably perfect, as it’s robust, built for attaching onto helmets and it features advanced video stabilisation for smooth fast-paced footage. Unlike our first pick, this GoPro camera needs an adapter if you’re looking to attach an external microphone, and rather than downloading straight to the PC, you’ll need to do it via a cloud account, but that’s not the end of the world. If you’re just starting out and looking for an ideal camera for shooting still footage, this one could be perfect for you. It features a 1.0-type Exmor R sensor, which should ensure bright, clear detail. This is accompanied by an extra wide aperture for even better handling of light. Thanks to Sony’s Capture One Express technology, the camera is capable of shooting precise colour and clear detail, so that makeup tutorial or culinary class footage will come up great. Because the camera is only capable of 10 frames per second, it’s not the best for fast action filming but if you’re looking to take your audience on a little tour, it does feature a stabiliser for a shake-free shot. Wi-fi enabled, you can instantly upload footage to your PC for editing, which means getting that new vlog ready for viewers is as painless as possible. If you’re looking to spend a good amount of money on a camera, it’s almost a shame if you purchase one that’s only good for one thing. While many reviewers say that this camera still favours video, they’re still very satisfied with the quality of the photos that they’ve been able to snap with this camera, making it perfect for vloggers who like to do a little photography on the side. Thanks to its galvanometer drive iris, this camera quickly catches up with changes in brightness, which is great if you’re shooting a video outside. The zoom capabilities of this camera should certainly catch the attention of photographers, while the High Sensitivity MOS Sensor allows vloggers and photographers to take a shot with minimal noise interference. The tilt screen also allows you to play around with angles while still allowing you full access to the shot you’re just about to take. Sometimes, the best vlogs are someone sat at their screen commentating on a game or television show, and you don’t need a £500 camera for that. If you know that the light in your bedroom is always the same, then there’s nothing wrong with taking a look at this HD webcam. It’s got a wide angle lens, so you can set the scene around you, while the Logitech RightLight 2 Technology and Autofocus ensures the camera will automatically adjust to improve the filming quality in low light conditions. Thanks to the dual stereo mics, sound quality is good enough for basic vlogging, but if you’re looking to do something more complex like a tutorial, you’d be better off forking out that bit more on a camera capable of an external mic connection. Our dual capability Panasonic pick earlier is a good buy if you have the money. But if you like the idea of a camera that can do a bit of both, but don’t have a spare grand tucked away, try this one for size. We’d say this one drifts more towards the photography side of things, purely because it doesn’t shoot in 4K and there’s nowhere to plug in an external microphone. Having said that, it has a large sensor and lens for making the most out of light conditions and the capability to make time lapse movies, if that’s your thing. Because you can shoot in Raw, you can maximise the quality of your footage during post production. Thanks to its Wi-Fi capabilities, you can control the camera via an app on your phone; this means you can place the camera in an awkward place to catch that incredible shot and still see what’s going on from your phone screen.